Summit Cove Elementary's fifth-grade teacher team celebrates their $700 cash award from YouthEntity as part of the "I am financial knowledge" program. From left to right: Noel Hansen of Alpine Bank, Summit Cove teachers Beth Wells and Sarah Stur, and YouthEntity's Gail Shannon. President Obama signed the Every Student Succeeds Act (ESSA) into law this past Thursday, Dec. 10, which is the first rewrite of 2001’s No Child Left Behind Act and now replaces that law. The new legislation lends greater flexibility and discretion to states and school districts as opposed to the one-size-fits-all national requirements that previously limited innovation at the state and local levels. In practice, it provides for the reduction in the amount of testing at each school, offering more decision-making power for the individual states and districts. Colorado’s State Board of Education met the day prior and reviewed the specific components of the ESSA. The new law continues to provide funding and accountability for students with the greatest needs—those in poverty, learning English and those struggling to meet the Colorado Academic Standards. However, it now allows for state expertise and priorities to be used in determining responsibility and interventions. It also allows for a small number of states to try new systems, though schools across Colorado won’t see any immediate differences between the implementation of the ESSA and the state’s previously approved Elementary and Secondary Education Act (ESEA) waiver request. In essence, Colorado will continue to use its own accountability system to meet federal requirements. Specifically, that means tests are still required for all students in English-language arts and math, third through eighth grade and once in high school. Science also remains required once per grade span (3-5, 6-9, 10-12). In addition, the planned implementation of the Colorado Measures of Academic Success (CMAS) tests this year, including math and English language arts exams created through the multi-state Partnership for Assessment of Readiness for College and Careers (PARCC), will go unaffected. 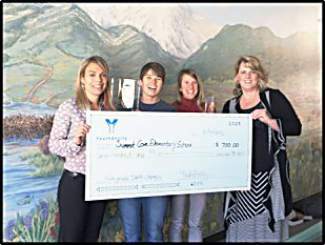 The fifth-grade teacher team at Summit Cove Elementary in Dillon received a trophy and $700 cash prize last week from YouthEntity for producing the highest test scores in their district as well as all grade classes in Summit County as part of the “I am financial knowledge” program. The award was earned during the 2014-15 academic year, and Summit Cove plans to spend the money on books and classroom needs. YouthEntity is a community and youth development initiative dedicated to helping youth succeed. The organization’s goal is to attract and empower youth to discover their potential by providing real-world learning experiences that help them prepare for future success in professional careers as well as life in general. “Part of setting yourself up for success is to have the knowledge and skills you need to manage your money,” said Kirsten McDaniel, YouthEntity’s executive director. Summit Cove students competed in the program with other elementaries from Basalt to Parachute, receiving complimentary workbooks and in-classroom instruction from trained facilitators. For those students who participated in the five-day financial literacy workshop, every correct answer on the final test accrued $.50, with the opportunity of earning up to $15 each. Alpine Bank, an employee-owned institution headquartered in Glenwood Springs, Colorado, helps support the “I am financial knowledge” program, allowing YouthEntity to provide the cash awards. For more information about YouthEntity, or to bring the “I am financial knowledge” to your school call (970) 963-4055, or visit http://www.youthentity.org.